POSSIBLE SPOILERS AHEAD. (But really, you should know Much Ado About Nothing.) The Mister and I have been trying to see this movie since it premiered at South By Southwest back in March. It finally opened nationwide this past weekend, and we (and TGG and his wife) jumped at the chance to get to see it on the big screen. It did not disappoint. 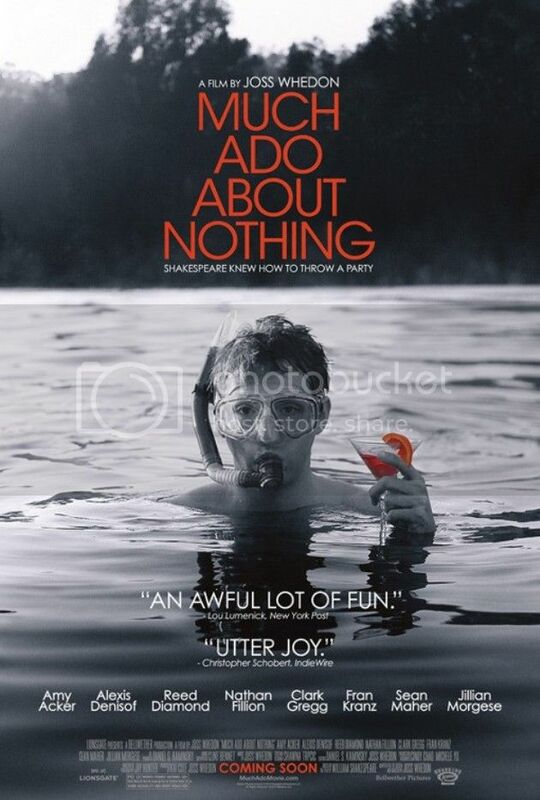 This version of Much Ado About Nothing—a play originally written by William Shakespeare—was adapted by Joss Whedon and filmed with a bunch of his friends over the course of a few days ... at Joss' house. The film is a modern version of the play, but only in setting; the original iambic pentameter is used throughout. This might turn some people off, but I love how well such an old and unfamiliar language can be understood through good acting. The basic story is about misunderstandings, revelry and the power of love. It features a variety of characters, both comedic and dramatic, and a happy ending (after a bit of tragedy in the middle.) The entire film is also in black and white, which makes it feel artsy, but not in a pretentious way. I'd definitely recommend this film to anyone who's a Shakespeare fan, a Whedon fan, or, like me, a fan of both! i've been trying to convince my husband to go see this with me... but i don't think it's going to happen- he is not a fan of the bard. however my mom was an english lit major and did a shakespearean study course in oxford- so i don't think it will take much convincing to have her go with me. ") it's a cast of my favorite people doing one of my favorites. i can't wait. Thank you for letting me know about this! I was in this play like 7 years ago (I played Hero, what a boring role!) and I now must see the movie!!! I just saw this last night, and I loved it. So well done, great acting. And how awesome is Joss' house? It's beautiful! Love the scenery. Hero is pretty low-key. But it's an awesome play. I hope you enjoy it!